My kids and I love going to the park but it's also great to be able to play in one's own backyard. Swing sets are the stuff of childhood but many of today's sets are enormous. What if you have a small yard? If you're looking for a swing set for small backyards, this guide is just what you need. For the purposes of this guide, yards with dimensions of 1,500 square feet or less are considered small. Even if you have a huge yard, you probably don't want a swing set to take up the majority of the space. With a small yard, you definitely don't want the swing set to take up the entire area because you have less square footage to work with from the start. Choosing a set that maximizes use of space and has a small footprint will leave at least a bit of room for other things, like a garden or a fire pit and comfy chairs. As a parent, safety is always my top concern. It's really important when choosing a swing set to think about not just the set's dimensions but also the dimensions of the necessary safety zone. After all, the very act of swinging means the child will go beyond the width of the swing set itself. It's important that there isn't a risk of hitting fences, tree branches, bushes, power lines, or the sides of structures like sheds or garages. A set that takes up less space also has a smaller safety zone. Many larger sets, like the Lifetime Big Stuff Adventure Play Set, require a much larger safety zone than you might realize. In addition to the space needed for safe swinging, there needs to be space for other activities that are a part of play like running and jumping. A space-conscious swing set for a small yard will be a safer swing set. How big of a safety zone do you need? The United States Consumer Product Safety Commission recommends that there is at least six feet of "landing zone" space on all sides of a swing set. They further recommend that the distance to the front and rear of swings should be at least twice the height of the bar the swing hangs from. For example, if a swing set has dimensions of 12'L x 10'W x 8'H, the recommended safety zone needed would be 24 feet in length (6 feet on either side of the 12-foot length) and 32 feet wide (twice the height in both directions) for a total of 768 square feet. Some swing set elements like trapeze bars or rings might need a few extra feet to the safety zone because of the risk of a child gaining a lot of momentum and making a flying leap. It's important that there isn't a risk of a dangerous crash. Many people will only look at the dimensions of the set itself and assume they have plenty of room. It's vital, especially with small yards, that you consider the size of the safety zone. Big swing sets simply cannot fit safely in small yards. Total footprint: including both length/width and the overall safety area you need available. Safety: weight limit, coated chains to prevent pinching, sturdiness, if/how it can be secured to the ground. Variety: how many different activities it includes - swings, slides, trapeze bars, seesaws, etc. Aesthetics: does it look nice? will you mind seeing it every day? Durability: how long will it last? will your kids grow out of it quickly? What do your kids like to do? Some kids can swing for hours. Others like going up and down slides repeatedly. Some kids are climbers. Others prefer more imaginative play. Some kids get bored easily and like a lot of variety. There is a swing set that is perfect for every type. Pay attention to the activities your kids gravitate to at the park. This will help you select the right set for your kid. How many kids will play on the set at once? If you have more than one child or your house is often the playtime headquarters for the neighborhood kids, this can inform your decision on which set to buy. Some sets will only accommodate 1-3 kids at once while others can accommodate up to 10 kids at once. If there will be a lot of kids playing on your swing set, you may want to get one with multiple activities to avoid fights about who gets to use it. What is the "landing zone" like? It can be important for kids to have a safe landing zone in case of falls or jumping. Grass is ideal. Cement can be dangerous. Wood chips or rubber mulch are a good solution to put over cement or hard, packed earth. The United States Consumer Product Safety Commission stresses the importance of a soft landing zone. A good swing set is an investment and with regular care and maintenance, it can last a very long time. Taking care of your swing set also ensures that it remains a safe place for children to play. This classic swing set is what I remember from my childhood. They may not look quite as fancy as the popular wooden play sets you see more often today, but these metal sets have stood the test of time. The footprint is quite small, with dimensions of 11'11"L x 10'W x 5'10"H. Even the smallest of yards can usually fit one in. If width is at a premium in your yard, the slide could just be left off. his unique swing set is probably not what you picture when you think of a swing set, but it is definitely worth taking a look at. It consists of a single swing. This swing is also probably not what you picture when you think of a swing. The large UFO-shaped swing mat can fit two children at once. Because there is only one swing, this set has the smallest footprint you'll find. It won't take up much yard space at all. The swing can feel safer to children than a traditional swing. This makes it ideal for toddlers just learning how to swing. The large fabric swing mat is both sturdy and comfortable. It has an almost hammock-like quality and some kids might enjoy just relaxing on the swing. It can be a perfect spot to daydream and cloud gaze. This is another swing set that keeps things simple and works ideally in even the smallest of yards. It also stands out for offering the unique ability to grow with your child. 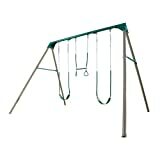 The support bars, the swing type, and the rope height are all adjustable. This means you can start out with a very small swing with a 5-point safety harness, suitable for a baby. 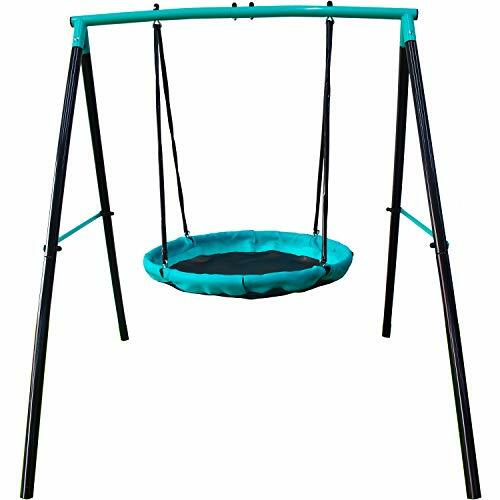 As your child grows into a toddler, the swing set's height can be adjusted and your child can graduate to using a chunky swing seat in a traditional belt-swing style. As they grow a bit more, the set can be adjusted to full size. Although the bars are quite thin, they are made from powder-coated steel and the set is surprisingly sturdy. There are also ground pegs included to secure the set firmly to the ground. This is an upgrade to the classic metal set. It is significantly stronger and more durable. The all-weather, high-strength, low-alloy steel really holds up over time. The A-frame design has a nice small footprint of 10 feet by 13 feet but Lifetime recommends a safety zone of 30 feet x 35 feet. It includes two swings and a trapeze bar. The trapeze bar could be replaced with a third swing if desired. Because there is no slide, the width of the set is kept pretty small. This set is quite simple but it can still lead to hours of fun and will last for years. Most yards can't fit elaborate play set swing sets but this playset fit for toddlers will work in a small yard. It features swings, a slide, and a small treehouse-shaped tower with a steering wheel for imaginative play. It is made with sturdy molded plastic and it comes with anchors for securing it to the ground. 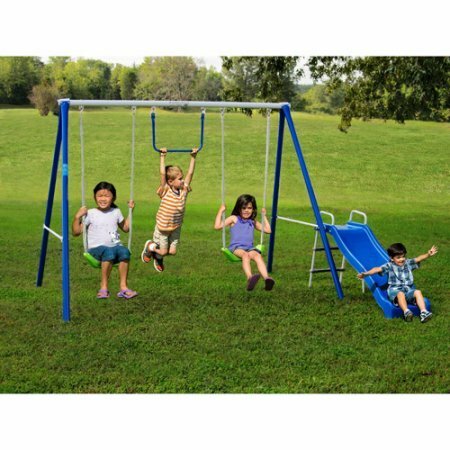 Each of these five swing sets has something different to offer and they are all safe and fun. Each of these will fit within a yard under 1,500 square feet and most will fit in yards that are much smaller. It's hard to pick a clear winner here but our choice is the Jump Power UFO Swing Set. It has a really small safety zone and it's quite sturdy and safe. It doesn't have all the bells and whistles but your kids can always get those at the park. This unique swing is unlike what you'll find there while still providing classic swinging fun. KiddyPlayground.com is a participant in the Amazon Services LLC Associates Program, an affiliate advertising program designed to provide a means for sites to earn advertising fees by advertising and linking to Amazon.com, Amazon.co.uk, Amazon.it, Amazon.de and other Amazon stores worldwide. Copyright text 2017 by KiddyPlayground.